A pungent problem is making its way across city borders as experts warn skunks are discovering the advantages of city life – and moving in. The nocturnal pests are not uncommon in Chicago-area suburbs, where they find lush lawns and food and burrow under porches and patios. But now, officials say they are showing up closer to downtown Chicago. 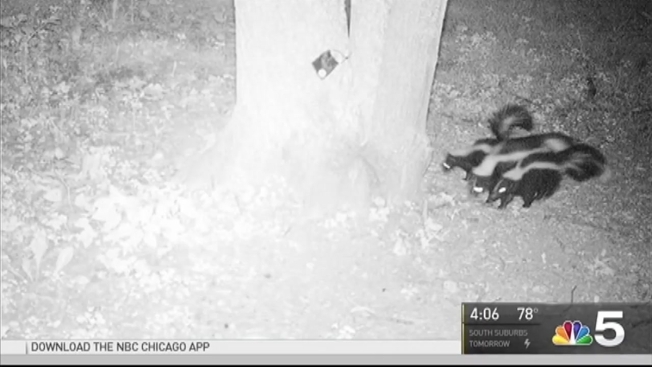 Lehrer said the zoo’s biodiversity monitoring study has about 100 trap cameras in downtown Chicago and the surrounding area, which have in recent months captured images of skunks appearing to migrate further into the city. “We think they’re getting adapted to living around humans and taking advantage of things cities have to offer,” Lehrer said. ABC Humane Wildlife, which handles indoor wildlife pest control for Chicago and for residents in the suburbs, said it has seen a 15 percent increase in its skunk captures since last year. “They are a little bit territorial so, they will edge and edge and slowly increase their territory and they’re moving into the city and since Chicago is a city of parks and the skunks love to eat the grubs and lush grass then maybe Chicago will be a city of skunks too,” said Rebecca Fyffe, urban wildlife manager at ABC Humane Wildlife. Experts say the skunks aren’t aggressive, but can spray up to 15 feet and have fairly good aim. If you stumble on one, it’s best to back away. Those who do get doused in skunk musk should trade in the traditional tomato juice solution for a combination of soap, hydrogen peroxide and baking soda, officials said.